With the rains already giving us teasers, the Wildflower Villas is where you should book your next holiday at. Why, you ask? Because those gorgeous views of the Sinquerim river and the natural beauty around will whisk you away to a whole new world. 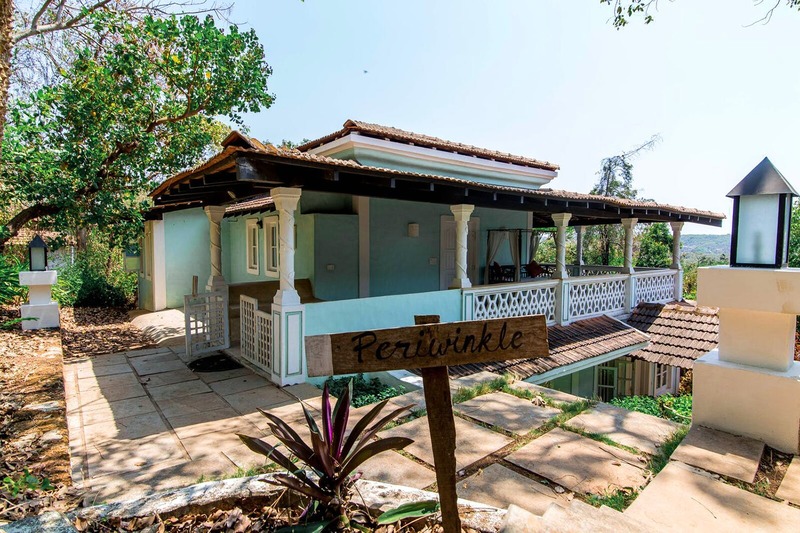 Perched on a hill in the Saipem village of Candolim, a drive on a small winding road uphill will take you to this boutique property. It is luxury spread across acres, and hidden in there are seven individual villas, each one guaranteeing privacy and a walk amidst the clouds during the monsoons. Each villa is designed in an Indo-Portuguese style with rustic décor, old furniture, traditional flooring, and partly outdoor bathrooms. And each one comes with one, two, or four bedroom options. So be it a romantic weekend or a getaway with your full gang, this property will cater to all your needs. Living up to its name, a walk around the property is like taking your own personal hike in nature, what with the abundance of trees and greenery around that also have frequent visitors of the colourful, winged kind. The restaurant at this property overlooks the valley below, with the river snaking through the lush paddy fields, coconut plantations, saltpans and Aguada Bay in the distance. With breakfast included, this is the perfect place to start your day with that cuppa Joe or tea. It almost feels like a holiday in the hills instead of Goa. You could also take a dip in their large pool. The best kept secret, by the way, is their eighth villa which is meant for senior citizens and has provision for the physically impaired too. Here, you get the option of getting meals served in the room as well as being in the closest proximity to the entrance of the property and reception area. Skip a night of partying and relax in their vintage balcaos that are a feature of each villa, with a bottle of wine, glorious sunsets and fireflies dancing around you. The sounds of silence is just what you need. Rates start from INR 6,500 plus taxes during the off-season months. Check here for more details and booking. Nishad & his wife Richa (both Goans), who along with their team run the property, and will make you feel all warm and cozy here, along with giving you the best insider tips.